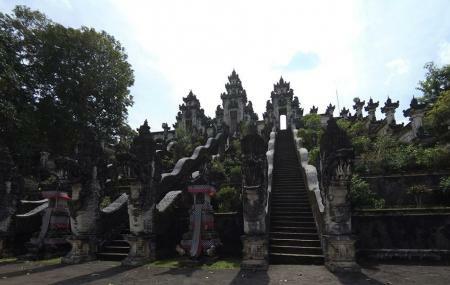 One of the three famous temples in Bali, Pura Lempuyang is for peace seekers and people who wish to witness the spiritual awakening. The temples are close to each other and lies on the famous mountain Agung providing breathtaking panoramic views of the surrounding. Shutter bugs will find this place absolutely stunning. The place is about 3-4 hours from Kuta and owns a stunning architecture reflecting the age old Balinese culture and beliefs. Ensure to visit early to make the best of it. The place is highly significant for the folks hence don’t be surprised to find it packed and crowded. Rather, take this as an opportunity to interact with them and see Bali up and close. Your worry of where to stay in Bali is sufficed by bunch of interesting and comfortable lodging options in the Bali like The Peacock Inn, Bije Sari Suite Bisma, Batu Empug Ubud and Gatra Ubud Inn. How popular is Pura Lempuyang? People normally club together Pura Pasar Agung Lempuyang and Pura Lempuyang Luhur while planning their visit to Pura Lempuyang. Great place for pics. That is all. You cannot drive directly to the temple. You need to take a payed shuttle bus of sorts from base to the temple. At the top you end up in a village at the entrance. You get to feel the slightly cooler altitude atmosfere. So thankful that the temple everyone wants a photo of is the closest one to walk to!!! We only went to this temple as it was so hot and neither of us wanted to be out in the sun for long. You need to make sure you dress appropriately - women and men need to be covered from the knee up as well as shoulders. They accept donations and you get given a sarong - perfect for photos! Good to note that the photo taken with the reflection is just a local kid holding a mirror against your phone lens - there is no lake!! Nonetheless, totally worth it!! As everyone we had to click a picture here not realising a huge queue was awaiting us. We stood in the queue for hours to finally pose and get some beautiful pictures here. Make sure you eat well and carry a bottle of water as the wait will be super long.